Every Lionhead rabbit has a mane. However, we can distinguish two different mane types; single maned or double maned. 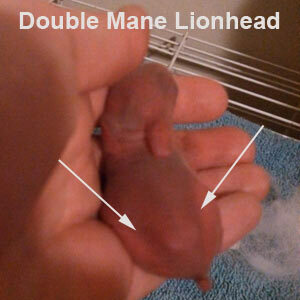 Important to mention, double maned doesn’t mean that the lionhead has two manes instead one. It has to do with the genetics of your Lionhead rabbit, he or she will either have one or two copies of the genes that produce the mane. When a lionhead rabbit is a double mane he has two genes that produces their mane. Double mane lionhead rabbits have also a regular mane of wool around their head. However, in contrast with single mane lionheads the mane covers the head a lot more and they have also have wool on their skirts, also referred to as their flanks. This mane type is by far the most popular, this is partly due to the fact that their mane won’t diminish. When a lionhead rabbit is a single mane he or she has only one gene that produces the mane. Single mane lionhead rabbits have a regular mane of wool that is situated around their head, their ears and occasionally their chest. When they grow older they might start losing their mane since their wool diminishes. Unfortunately this is a process that can’t be stopped. How can you tell whether your lionhead rabbit has the single or the double mane gene? The only way to find out whether your lionhead rabbit is a single mane or a double mane is to carefully examine them directly after they are born. A baby that looks like a common rabbit baby is likely to be a single mane lionhead rabbit. Their manes will start developing when they grow older. 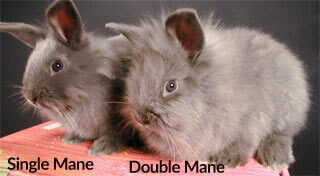 A baby that already has a noticeable V form around their skirts/flanks is a double mane lionhead rabbit. Please keep in mind that after they start developing their manes it will be almost impossible to identify how many mane genes your rabbit babies have. Therefore most experts advice to mark them in some way right after they are born. Double mane Lionhead, see the “V” pattern. The mane gene is a dominant gene. This means that if you cross a lionhead rabbit with an other rabbit breed the mane gene is stored in the dna of the rabbit baby. For more information and question and answers related to the mane genes we refer our frequently asked question page.